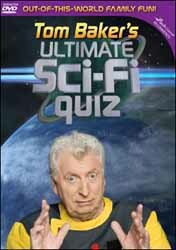 Tom Baker's Ultimate Sci Fi Quiz is just one of a hundred or so interactive test-your-knowledge DVDs (covering everything from Bullseye to Emmerdale) which have leapt, seemingly with a life of their own, on to the shopping shelves in time for Christmas. On face value this should be the ideal purchase for any visitor to (or reviewer for) Sci-fi-online, but does it match-up to expectations...? The premise behind the concept is that you are the captain of the SS Hawking, a research vessel which has been sucked into a wormhole and thrown 20,000 light-years from Earth. Your ship carries invaluable information about black holes which is vital in the fight against the Martian Separatists. You attempt the journey home by answering questions (sounds like a particularly bad Blakes 7 plot to me). Kirk never had this trouble; he simply punched out the bad guys and seduced the green-skinned ladies with three breasts. Anyway, the questions are grouped into twelve categories. You select a category and are given five questions, for which you are offered four options each. If you answer correctly your ship moves forward 1,000 light-years (1K), and if you get it wrong you remain in position. The goal is to get back to Earth before the questions run out. There are six rounds in a game, with five questions per category. So you need to answer twenty out of thirty. Just to confuse matters, periodically you are given a "Wormhole Detected" warning, and if you mess-up on the next question you are moved back 1K. The two player option differs in that you both play the same categories, but you can be thrown behind or in front of the other player depending on how you fair after the wormhole warning. Tom Baker asks the questions, and it's obvious to me that he's only there as a name to capture potential sales. One moment you get caught up in his enthusiasm and another he seems acutely embarrassed. The first time I played this game I answered every question correctly. The queries are not very simple, but any long-time follower of science fiction is going to know most of these answers. Over the next few tries many of the same questions popped up, leaving me wondering just how many there really are. Some categories I wasn't so hot on, but I still had to purposefully answer incorrectly just to discover what would happen at the end (not much - just a little bit of sarcasm from Baker). Clips and stills are used from many films, but certain movies and subjects seemed to arise more than most. The Land That Time Forgot, The Hitchhiker's Guide to the Galaxy, and Doctor Who are just three examples. All of this silly scenario is superfluous to requirements; it would have been much better to ask general SF questions and specialist subject ones, with perhaps the rewards for success being the unlocking of certain film and TV clips. The worst thing I found about this release is that at no point does it allow you to pause or fast forward, so if the telephone rings or someone knocks at the door you're stuffed.